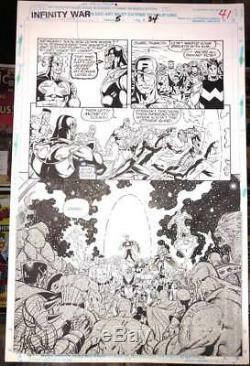 34 Original Comic Art Page Thanos Captain America Ron Lim. Be Sure to Check Out. Our other weekly auctions Here! Original Comic Art by Ron Lim (Pencils) and Al Milgrom (Inks) - Infinity War #5 Page 34 featuring 2 image of Thanos, lots of Heroes, and a Splash panel at the bottom. Everything is original pencil and inks and in nice shape. Features Cap reminding Thanos that they took him down when he had the Infinity Gauntlet in Infinity Gauntlet. For grading raw comics, we use the industry standard 10-point grading scale. Pictures and Scans are always of the actual piece that you will be receiving. We NEVER use any stock photos on comics or art. All Raw Comics Come Freshly Bagged an d Boarded. All Graded Comics come in Mylar Sleeves. Comic Books, Original Comic Art, and Vintage Action Figures. We also travel for high-end pieces, collections, or warehouses/store stock. As an authorized dealer for both CGC and CBCS, we are very familiar with the industry standard 10-point grading scale. At Nikelspot, our goal is consistency. We want to grade our raw books in such a way that you know what you are getting week in and week out. With that said, grading can be subjective within certain grade ranges. And not only that, but we would never want a collector to get stuck with a book that they did not feel good about. And please be sure to check out. Tailor your auctions with Auctiva's. 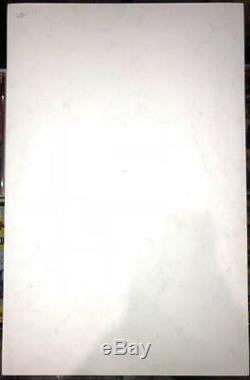 The item "Infinity War #5 Pg. 34 Original Comic Art Page Thanos Captain America Ron Lim" is in sale since Saturday, March 17, 2018. This item is in the category "Collectibles\Comics\Original Comic Art\Interior Pages". The seller is "nikelspot" and is located in Fort Mill, South Carolina. This item can be shipped worldwide.